You've bought your grill. You've chosen your recipe. But what now? You’ve come to the right place. Here are the four easy steps to using a charcoal grill. Mastering charcoal grilling doesn’t just happen overnight. It takes baby steps, patience, and skill. For this reason many start out their barbecue careers on a propane grill. 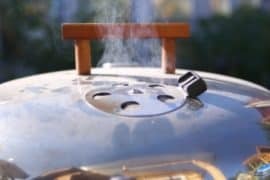 These gas grills are usually easier to use because they often feature a simple display of buttons and knobs that help you know what to do and get started quickly. As a lot of BBQ fans (myself included) will tell you though, the quality of propane cooking just isn’t as good, and cooking on charcoal is where you want to be. For a lot of people, moving onto charcoal models is an intimidating step up. 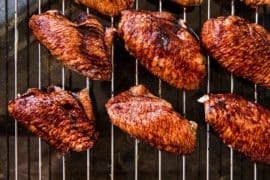 It can take a while to get them going, and getting a handle on controlling the grill surface temperature can take a bit of getting used to. Thankfully, charcoal grilling doesn't have to be difficult. As long as you know what to do you, the flames will always be in your control. Here are four tips to turn you from novice into master. Lighting a charcoal grill is easy. Simply dump the charcoal into the grill and arrange it into a pile. (You will spread the charcoal out later.) Douse the charcoal in lighter fluid. Be careful, but don't be shy with it either! Finally, light a match and toss it onto the charcoal and watch the flames of our grilling ancestors soar into view. For convenience, some charcoal actually comes in single use paper bags that can be lit after dousing in lighter fluid, but whichever method you decide to use, make sure you give the flames ample time to work their magic. The flames are heating the charcoal. It will be this same heat that will cook your dinner. Don't rush it. Good things come to those who wait. Here's how to light a charcoal grill. Next, you will need to control the heat from the charcoal. This can be done through several methods. First, if your charcoal grill has a lid, you can close it. This will trap the heat inside of the grill. Lids will often have a thermometer on the top to help you gauge the temperature inside. 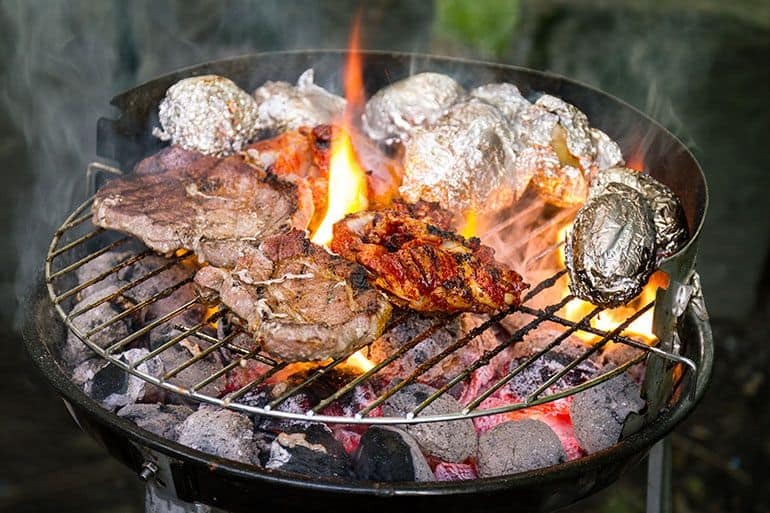 Second, if you desire to increase the heat in your grill, you can fan the charcoal. This can be done with a Tupperware lid or a similar flat and stiff item. Fan the charcoal at the base. The increased oxygen will cause the charcoal to glow bright red, increasing the heat for your food items. Finally, you can adjust the grill on many charcoal grills as well. You can lower the grill grate closer to the charcoal for increased temperature. You can raise the grate if you wish to decrease the temperature. here's how to control heat with indirect grilling. Cooking on a charcoal grill takes patience. From the instructions above, you can adjust the temperature on a charcoal grill. However, keep in mind this temperature maintenance isn't as clear cut as you might find on a propane grill. This means you will be standing by your grill watching the food a little bit more than you would a propane grill. Of course, that's okay! Who doesn't want to be tending the grill? Take your time, and you will do fine. Remember, cooking on charcoal is a bit of an art form. You need to watch and check the food frequently. Usually, it's best to fan the charcoal towards a high temperature, sear the meat with the high temperature, let the charcoal cool slightly, and let the lower temperature cook the rest of the meat. This helps lock the flavors inside of the meat. It's also part of the art of charcoal grilling. Propane grills have difficultly reaching such high temperature to get a good sear. Fortunately, with your positive attitude and fan, you can make those searing temperatures happen. The last step in knowing how to use to charcoal grill is the cleaning that comes afterwards. Yes, there is a bit more of an after party for charcoal grills. This is simply part of grilling like a pro. However, don't worry. The cleaning isn't that arduous. After you have managed to put the grill out, scrape the grill grates with a grill brush when you are done cooking. This is done easiest when the grill grates are still warm from the heat. Second, dispose of the charcoal after it cools. Then, gently brush out the insides of the charcoal grill. Next, you will want to pay particular attention to the vents on your charcoal grill. The vents are important because they allow all of that oxygen you were creating with your fan to reach the charcoal. You may need a small wire brush to clean these effectively. Finally, use a mild soap and water solution to wipe clean the inside and outside of your grill. You can use a dish cloth or a paper towel for this task. Also, check the ash tray that may be located under your charcoal grill. This may need to be emptied and wiped clean as well. Here's how to clean cast iron grill grates. That's it! You can now use a charcoal grill like a pro. You know how to light a charcoal grill, you know how to tame those wild charcoal grill temperatures, you know how to cook on a charcoal grill (particularly how to sear meat with the awesome temperatures a charcoal grill can reach), and you know how tackle the charcoal grill "after party" by cleaning the charcoal grill when everything is all done. The last thing you need to realize is that charcoal grilling takes a little practice. Once again, a charcoal grill isn't a propane grill. That's why it seems more manly to use a charcoal grill. You are literally taming the fire of our forefathers every time you fire one up. Happy grilling!